Both of these records have been getting a lot of press, but there's good reason for that - they're both fantastic, and deserve every bit of exposure that they receive. First is the debut (sort of) LP from NYC's Margaret Chardiet, also known as Pharmakon. She's been making power electronics and noise for about 5 years, and after a handful of well-received CDrs and cassettes on smaller labels, this is her first studio album and first work that will see wider distribution. 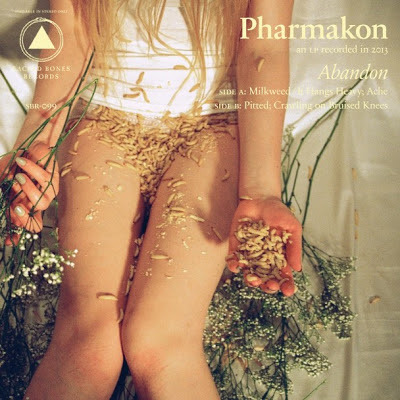 The mainstream press has even been doing their due diligence in looking into Pharmakon - I think NPR even did a short piece on her - and it's good to see someone who has worked so hard having some degree of success, on her town terms. The LP contains 4 songs - about 27 minutes worth of new material that is all wonderfully brilliant. Evocative atmospheres over well-crafted, textured noise collages (which often include her scathing vocals) that never become overly harsh or overwhelming. The songs - and these are actual songs - are downbeat, somewhat dramatic, and absolutely satisfying in every way. It's tough to be emotionally moved by noise music sometimes, but this record does the trick, and it's more magnificent every time I hear it. I can't gush enough about how good this record is. If you're going to buy one noise record this year, this should probably be it. You might even consider getting the limited edition of this, which comes with a cassette with another 27 minutes of killer music. 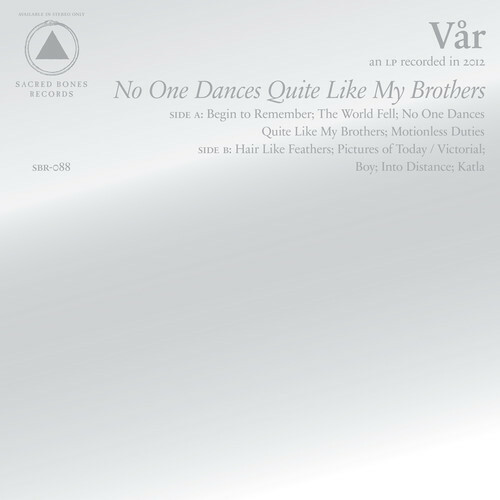 Second is the new record from Copenhagen's Vår, which started as a project featuring just Loke Rahbek (who runs the excellent label Posh Isolation) and Elias Rønnenfelt, but has since evolved into a more mature 4-piece. The 9 songs on this LP are influenced by everything from noise, to pop, to punk, industrial and other forms of electronic music. The sound is gritty and edgy, and even though the album seems to alternate between melancholy inflections and more upbeat tones, the songs are devastatingly catchy and memorable. I honestly didn't think I'd be into this record all that much, because there are all of a sudden a hundred thousand bands trying to do this, but this record is really well-done, and has earned a very high recommendation. I'd prefer the layout, at least in terms of the cover art, to be a little less... formal, but the music makes up for the unimaginative design. And again, there is a special limited edition, if you're willing to shell out twice the price of the standard edition. Both of these records should be shipping now from Sacred Bones.